NOTE: To enter this week’s giveaway for a prize pack from American Crafts, fill out the form at the bottom of this blog post. I’ve seen a bunch of these words art images from Silhouette over the past few months and I adore them! Finally I had a chance to use them since they released the Silhouette Studio software for a Mac (you can only access the Silhouette Store through their software). Anyhow, this card came together super quickly once I had the words cut. I mention it in the video, but gluing it to the card would have been much simpler if I had spray glue. But in the pinch, you use what you have, right? 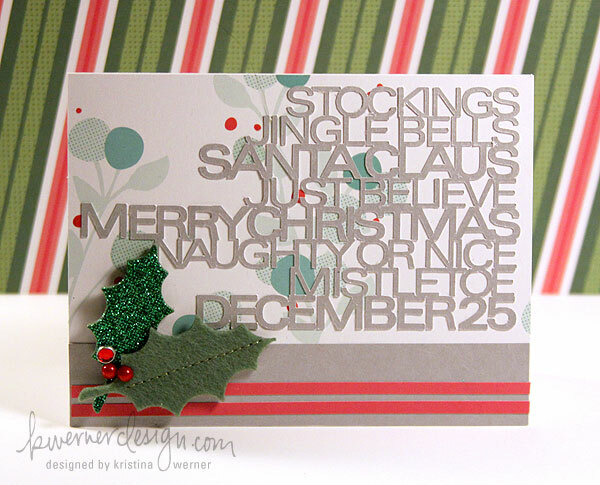 I used this specific paper from American Crafts’ Dear Lizzy Christmas collection for the card, and the Tradition Detail Stickers from the same collection for the holly leaves. Disclaimer: The American Crafts supplies used were provided by American Crafts. All other items were personally purchased.